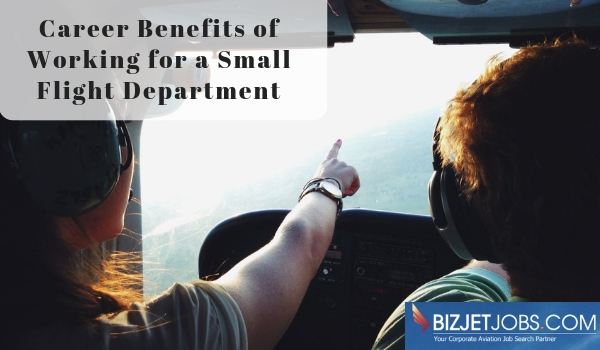 For some corporate pilots, working for a small flight department is the way to go. Big corporate flight departments offer some big perks, for sure—flying in-demand aircraft, generous benefits, bigger salaries, fancy offices and even sometimes the ability to be typed in new planes. But when it comes to professional growth, bigger doesn’t always mean better. Small businesses offer excellent career opportunities. One of the key advantages of working for a small corporate flight department is the ease with which you’ll be able to create change, and see the impact of your hard work. As a big cog in a small wheel, you’ll be able to connect with executive management more easily. Your suggestions, efforts and improvements to process and any cost-saving measures you help implement are more likely to be rewarded. Your responsibilities will be more broad. Since some of the top factors in job satisfaction are the ability to make change and be recognized, working at a smaller flight department could mean a happier corporate pilot job. Still not sure if a small company could be the right career move for you? Here are our top 10 reasons why life at a small flight department might be great. You can move up quickly. A small team means you’ll have fewer peers vying for the same positions. Prove yourself and you’ll see upward potential. You can wear many hats. This can be a blessing and a curse! A small business stays afloat by putting together hard-working teams of people who aren’t afraid to roll up their sleeves. Job titles can easily overlap. Instead of delegating tasks, you’ll figure out how to get them done—and learn a lot in the process. You’ll feel more effective. It’s usually easier to get a real sense of what a small business does and how each employee impacts the work. Small businesses are lean, agile and effective – or they’re out of business. You’ll work more closely with senior leaders. Instead of seeing your boss’s boss once a year, you’ll likely work in the same office. One of the most important reasons people advance in their careers is through true mentorship, gaining a thorough understanding of how people in senior positions do their jobs. Small businesses can feel like family. If you like getting to know the people you work with, you’re in luck—you’ll spend a lot of time working directly with them. The owners of your company are much more likely to make decisions with you specifically in mind. You’ll learn to impact the bottom line. Without a huge sales department, you’ll get the chance to understand the company’s core value proposition, and maybe even make a pitch to potential customers. Understanding the business at this level lets you understand how to run it – a very transferrable skill to any other job you’ll have. You’ll be effective at making change. If you have a new idea, you may be asked to try it out quickly to see if it works. Small companies are less tied to policy and precedent than big conglomerates. There’s often a more relaxed dress code. You’ll feel a sense of ownership. When you’re one of a handful of people working at a company, every success is celebrated by the whole team. You’ll stretch your creativity. Because smaller businesses have smaller budgets, you’ll find creative new ways to accomplish your goals. For example, instead of hiring an event company to plan and implement the business’s presence at an industry trade show, you’ll have to get creative to make a splash. At BizJetJobs.com, our staff of industry experts and friends has become a family eager to help continue the journey for our corporate pilot and corporate aviation employer members. We are available by phone and email to answer questions, and we continue to be the corporate pilot advocate. Need additional motivation or have questions? Give us a call, we’re here to help. This entry was posted in Blog, Job Search, Pilot Advice, Pilot Jobs by Amanda Jenkins. Bookmark the permalink.